NOTE: This information is not provided as legal advice. Always consult a lawyer and seek legal guidance. This advice is generally provided and not meant to be an exhaustive guide for personal safety. Home protection self defense is critical if you want to keep yourself, your family and your home safe from all sorts of dangers. With rising crime including burglaries and home invasions you can never take too many steps to stay safe even when at home. There a 5 components of home defense that can help with your protection and safety. By combining these five components, you can gain a huge advantage that burglars and other criminals won’t expect. The first of the 5 items for great home protection self defense, an alarm system is very important and can provide a bunch of benefits that will keep everything within your home safe. Fire, security while away and security while at home are the biggest benefits of an alarm. The great thing about an alarm is that you never need to worry if anyone is in your home and if there is or was, most alarms will let you know. Alarm come in two basic types monitored and not monitored. When a monitored alarm is set off a signal will be sent to the proper emergency division so the proper help is sent ASAP. If there is a fire then the fire company will be sent, a break in will cause the police to be sent. Some alarm system even allow to have a medical button or pendent that will immediately notify an ambulance of a problem. Monitored systems are normally professionally installed and can vary greatly in price. Most monitored alarms will require a reoccurring monthly fee. Non-monitored alarms can do a few things when they are triggered including an audio siren, strobe lights and some even can call your cell phone or several phones when set off. I have seen one that will even allow you to listen in on the situation from your phone after it calls you. Non-monitored alarms can be purchased for as little as $20 and can go up to $1000. I highly suggest an alarm of some type to help keep your home safe while your not home. A good surveillance system will let you know what is going on in your home or what went on in your home while you were not there. Most surveillance system cover at a minimum the front door of a home and can include many cameras covering the entire inside and outside. There are hidden cameras that will blend perfectly into any decor allowing you to have a system without the unsightly bulky camera in the corner. Surveillance systems can be wired, wireless and can even have built in recorders that you just plug in and go. Modern technology allows you to connect your cameras to a computer and be watched over the internet. With the advancement of smart phones you can even keep an eye on you home from your cell phone and it’s pretty affordable. This solution is great if you want to watch you children that are home alone or just for general security. Blockades are devices that keep people out and can include items such as fences, door locks, door bars, window bars and a few other specialty products. Properly securing you home with good quality locks is your best start. After getting good locks it is always a good idea to reinforce your door if it is not metal or high quality wood/fiberglass and reinforce your door jams to prevent kick-ins. It is much easier to kick in a door than most people think so take the time and spend a few exra bucks to reinforce. There are specialty locks available that lock a bolt in the up, down, left and right positions and will make your door near impossible to break down. If security is a major concern then you may want to install window bars or security film on lower windows to prevent entry. 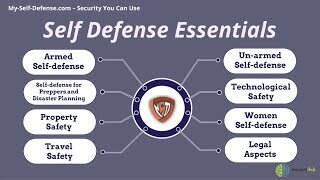 Defense is a must in every situation, especially home protection self defense. There are many devices available to provide defense for your home including firearms, large pepper sprays, tasers and stun guns. I highly suggest having a 1 pound pepper spray available at all times as they are one of the most effective self defense devices available on the market and do not kill. I do not suggest a firearm for defensive purposes because a lot of mistakes are made and the wrong person seems to end up shot fairly often. If someone is sprayed by pepper spray, they will be disabled for an hour or so and will soon get over it. No life lost. Being aware of your situation at all times is perhaps the biggest step you can take for proper home protection self defense. Noticing thing like people watching you and following you shold always be noticed. When going to your car or entering your doorway you shold pay perticular attention of others in your area and what they are doing. If you are aware of a problem you will have time to pull out your self defense device and have a much better chance at escape. It is always a good idea to keep bushes and trees trimmed to prevent people from hiding in them. You should also secure ladders so they can’t be used to enter upper floors. Pay attention and you stand a much better chance of attaining home protection self defense. To find out more about what you can do to be more aware, visit home self defense.